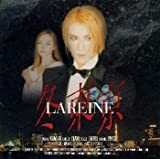 Lareine (stylized as LAREINE) was a Japanese visual kei rock band formed in 1994. The band's name is reported to have come from the French Queen Marie Antoinette. In 1999 the group signed to Sony, later in 2000 when all other members left, Kamijo created Applause Records. After a number of line-up changes and the release of several albums, EPs and singles, the group disbanded in 2007.